Take a journey into the deep beyond and return with the richest treasures and wonderment you could ever have imagined. Click here to play! There is plenty to be plundered in the depths of this foreign world, so start playing today for your chance to win! 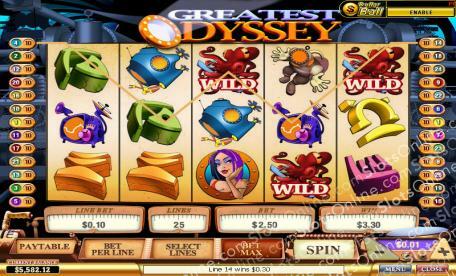 Greatest Odyssey is a thrilling 5-reel slot played across 25 pay lines, where the more lines opened means more chances for winning combinations. The Octopus is Wild, and can pay out up to 5000 coins on jackpot spins, while the Treasure Book is Scattered and can appear anywhere on the reels to earn a payout. If you manage to spin three Ladies on active pay lines you will trigger the lucrative Bonus Round! There are so many ways to win on Greatest Odyssey so start your epic adventure by playing and winning today! The Treasure Book is Scattered, and while it doesn't payout immediately, it will multiply all wins for 10 games when three or more appear at any one time. The Lady is a Bonus symbol, and when three or more appear on active pay lines the Bonus Round will be triggered. Playtech slots give you the option of several numbers of auto play spins anywhere up to 1000 spins. It provides a delay between each spin, which you can adjust, giving you time to see exactly how much money you win each spin. Playtech also gives you the ability to stop your auto spins when a jackpot is won, a single win exceeds a dollar amount, any win, an increase or decrease by a predefined amount or simply, when the number of spins are complete.